YOKOSUKA, Japan - The guided missile destroyer USS John S. McCain (DDG 56) departed Subic Bay, Philippines aboard heavy lift transport vessel MV Treasure en route to Fleet Activities Yokosuka, Japan, Nov. 28. 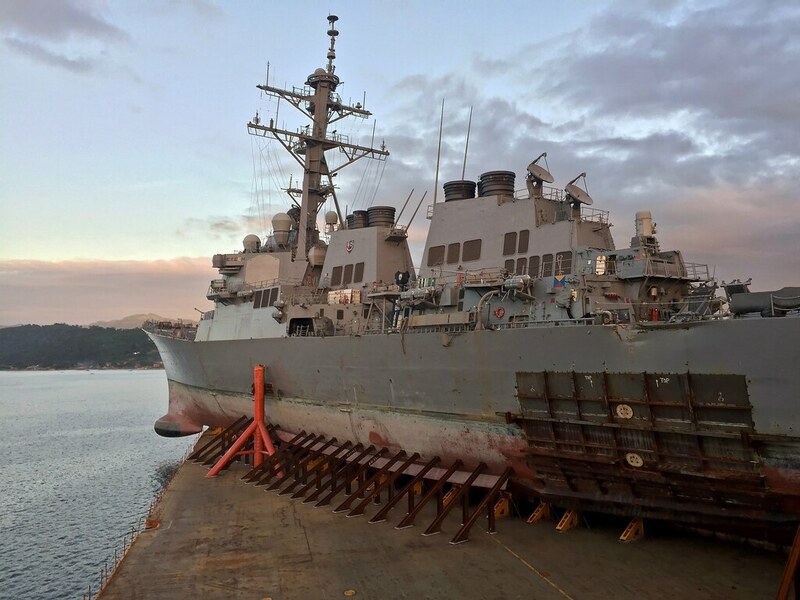 John S. McCain was diverted to Subic Bay Oct. 22 due to poor weather conditions and to repair cracks in the ship’s hull discovered after the ship departed Singapore aboard MV Treasure. While at anchor in Subic Bay, technicians inspected the cracks and determined the ship needed additional blocks under it to support and distribute its weight on the heavy lift vessel. John S. McCain was involved in a collision with the merchant vessel Alnic MC while underway east of the Strait of Malacca and Singapore, Aug. 21. Following the collision, the ship moored at Singapore’s Changi Naval Base. In the weeks prior to departure from Singapore on Oct. 5, crew members, technicians and divers prepared the ship for the journey by patching damaged sections of the hull and placing key systems in layup maintenance. The Navy released findings from its investigation of the collision as part of the Comprehensive Review of Surface Force Incidents, published on Nov. 2.